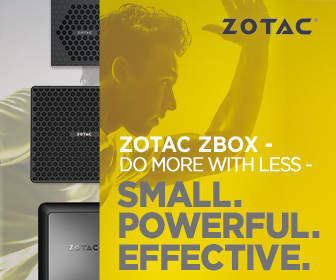 HONG KONG – September 8, 2015 – ZOTAC International, a global innovator and manufacturer of graphics card and ZBOX Mini PCs, ramps up the gaming power with the MAGNUS EN970 series. Minimalism, portability, and an all new design thinly mask the power density lurking beneath. Powered by a 5th gen Intel Core i5 CPU and NVIDIA GeForce GTX 960 with 3GB GDDR5 VRAM at the heart of the MAGNUS EN970, there is plenty of firepower for intense gaming and graphical work. Immerse deeper and work wider with quad-display support via NVIDIA Surround, and react faster with dual gigabit LAN or 802.11ac WiFi. The MAGNUS EN970 features a RAID-ready storage setup that provides either blazing access speeds or the power of real-time mirroring protection. The MAGNUS EN970 is Windows 10 ready and can take full advantage of Direct X 12, so you can get even more juice from the already powerful hardware. An all new designed housing in the same portable form factor means the MAGNUS EN970 is ready to game beyond the desk. Matte-black finishing on a minimal design thinly veil the powerful hardware. Whether it’s for the living room, desk, or for a LAN party, the MAGNUS EN970 has both looks and strength to power your play. The MAGNUS EN970 also comes with a PLUS version, pre-installed with 8GB memory and 120GB M.2 SSD. The Mini PC is easily upgradable with an easily accessible SO-DIMM ram slots and 2.5” HDD/SSD slots for further customization. Coupled with 4 USB 3.0 and 2 USB 2.0 slots, you have plenty expansion possibilities even after connecting your peripherals. Power your play today with the MAGNUS EN970.